Meeting the world’s growing power demands requires efficient, bulk transfer installations and, while all systems can be expected to work well in the early stages, few can deliver decades of reliable service with minimal input in the way that Siwertell systems do. 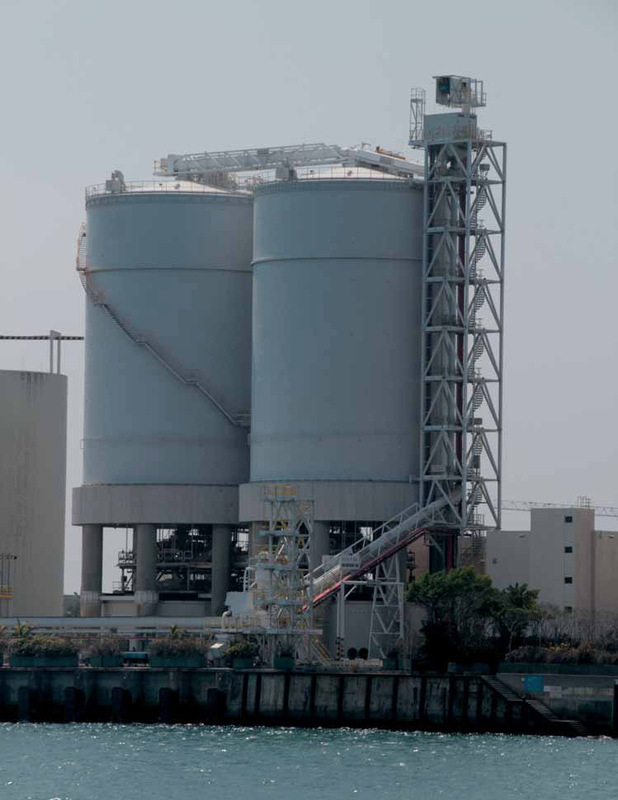 For two decades Siwertell systems have been in operation, without upgrade, at Hong Kong Electric Group’s Lamma Island power station’s flue gas desulphurization plant. The company’s Lamma Island facility has been in operation since 1982. Twenty years ago, in a move to make the primarily coal-fired power station more environmentally friendly, the company installed a flue gas desulphurization plant. The project called for an environmentally friendly, fully enclosed limestone discharge and transfer system with a guaranteed noise level of less than 75dBA, consuming less than 1kWh/tonne from ship to silo. It was no problem at all for Cargotec to meet these criteria, as its Siwertell bulk handling products are all designed with fuel efficiency, low noise levels and minimal environmental impact among the key drivers. Cargotec supplied a rail-mounted ST 490-F Siwertell continuous screw-type unloader feeding into a screw conveyor system. A coverbelt with a belt lifter allows for continuous loading of material onto the jetty conveyor. The totally enclosed system provides dust and spillage-free operations. It was designed to handle limestone powder from ships of up to 10,000dwt at a rate of up to 400tph (tonnes per hour), elevating the material by 32m to the top of the two silos. “Siwertell technology was ideal for this design brief ” says Conny Johanson, sales manager for the Siwertell brand at Cargotec. “When a Siwertell screw-type conveying system is used in conjunction with a Siwertell screw-type unloader, the entire system can be totally enclosed, delivering exceptionally clean performance. Hong Kong Electric’s conveying system employs Siwertell HSC 800, HSC 800S and SEC 601D horizontal, inclined and vertical screw conveyors. The equipment was designed to allow for the installation of an additional unloader if required in the future. Hong Kong Electric Group says the design, construction, delivery and commissioning was carried out to its satisfaction and, since then, the system has been reliable and durable in operation with no serious problems, displaying acceptable wear rates. Customer care from Cargotec has been good, it says, adding that periodic planned maintenance has been carried out without any problems and it expects to continue operating the system for as long as the desulphurization plant remains in service. Siwertell puts its long experience in screw conveyor technology to good use in this field, offering systems that can cope with the most demanding terminal installations, offering horizontal, vertical and inclined screw conveyors. “With these we can design and install highly efficient, totally enclosed bulk material transfer systems for virtually any terminal, including those with complex conveying requirements,” he notes. “A single screw conveyor can elevate material by up to 40m depending on size and capacity. If you need to raise material higher than that, we combine two or more conveyors in series, one feeding into the other. We apply the same principle for extended horizontal conveying requirements. “Furthermore, by arranging conveyors in parallel we can deal with very high capacity situations, increasing the amount of material that can be handled per hour simply by installing two or more screw conveyors alongside each other, served by the same loading box. Siwertell screw conveyors offer very compact solutions. For example, a vertical screw conveyor takes up much less space than a bucket elevator, so it can be used even where space is very limited. The highest capacity Siwertell vertical screw conveyor currently available is the VSC 700 with a capacity of 1,500tph. An important feature of Siwertell screw conveyors is the easily replaceable, wear resistant intermediate bearing. Its useful working life is governed by factors including the material handled, but when the time comes for replacement, the process is quick and simple, keeping downtime to a minimum. Generally speaking, Siwertell vertical screw conveyors involve less capital investment than systems employing other technologies. Their rigid, heavy-duty construction also reduces deterioration and enables easy maintenance at infrequent intervals. In addition, the flexibility inherent in the design and the different ways in which the basic components can be arranged means that they can be used to meet complex conveying requirement, Johanson explains.